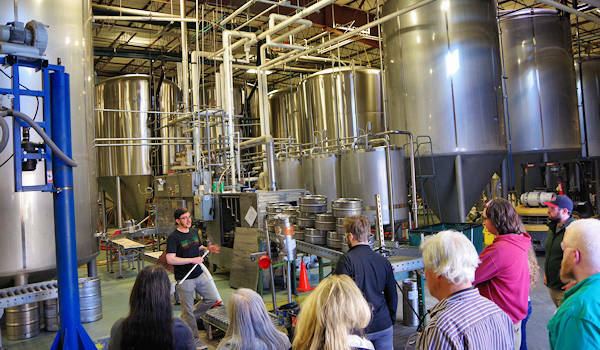 For an up-close look at and taste of Asheville beer making, head to Highland Brewing Company, one of the South's oldest and largest craft brewers. 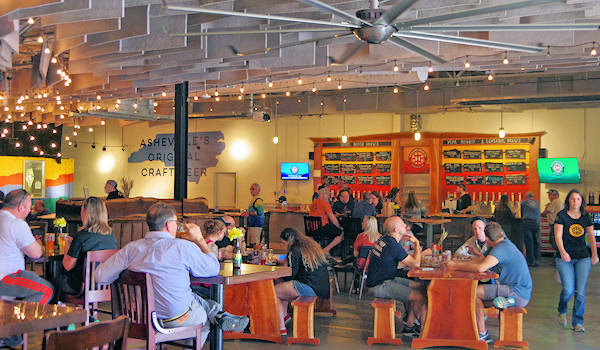 They are our favorite brewery to visit since they rolled out its first beer kegs in December 1994, leading the way for craft beer in "Beer City USA" Asheville. Their big Tasting Room is open every day with 15 or so of their brews on tap. Plus, a stage provides many nights of live music. 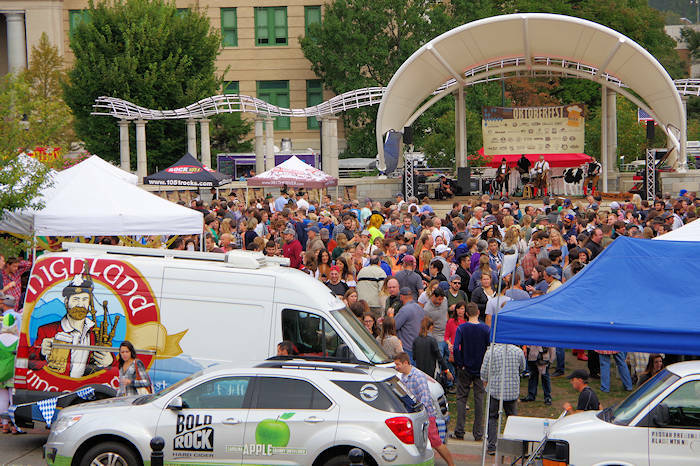 During warmer months, head outdoors to meadow for music and festivals. 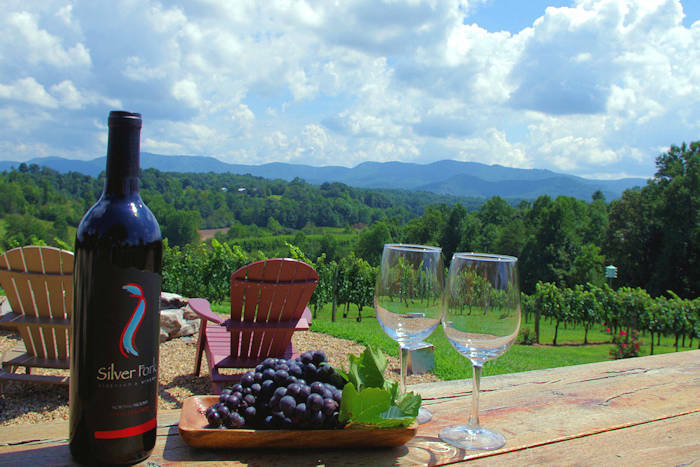 A rooftop terrace is open many nights to watch the sunset over the mountains. 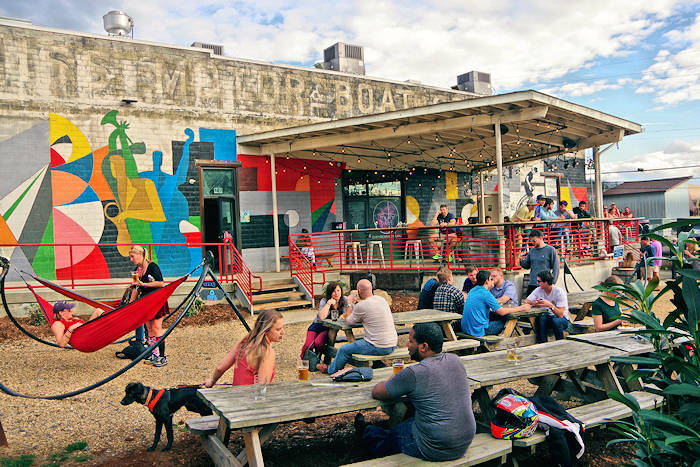 They have plenty of free parking, and it's a quick 5-mile trip from downtown. 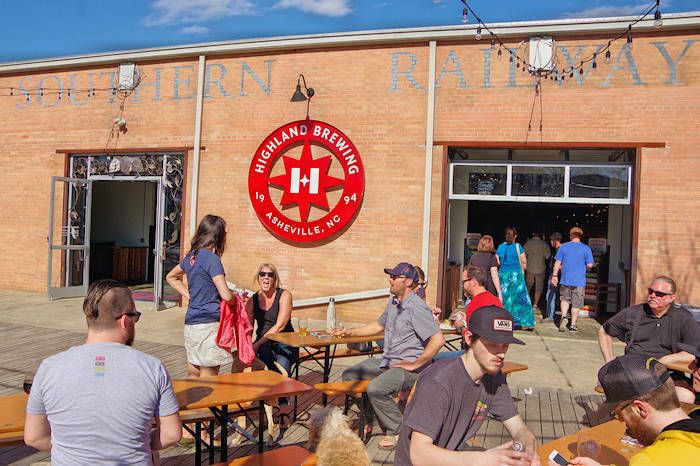 Friday, May 3, 2019: Highland Brewing 25th Anniversary Party outdoors in their Meadow with brew premiers, limited small batches, live music, food and much more 12-10 PM with free admission. Limited tickets available for the VIP Party with access to exclusive beers, one beer token, complimentary food, free VIP parking, and exclusive Rooftop Bar access. 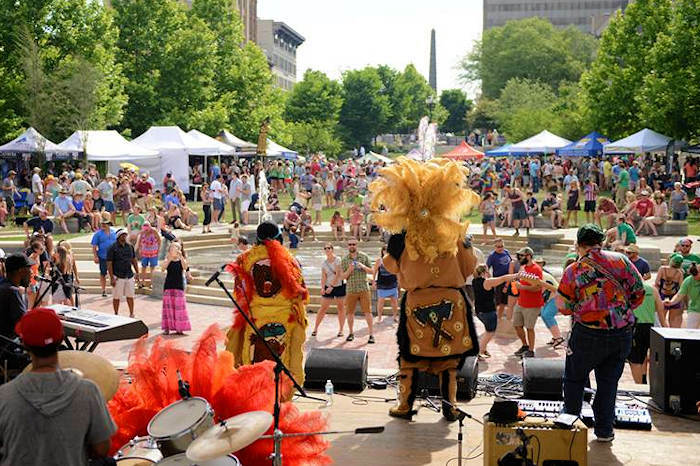 Music line-up includes local favorites Yo Mama’s Big Fat Booty Band, Travers Brothership, Josh Phillips & The Feel Good, and DJ Marley Carroll. Gaelic Ale: Their first beer is still their most popular by far. This deep amber-colored American ale features a rich malty body. Cascade and Willamette hops add a complex hop flavor and aroma. Oatmeal Porter: A unique robust beer black in color, very malty with hints of chocolate-roasted flavor and a well balanced hop character. St. Terese’s Pale Ale: A golden pale with a slightly malty body balanced by a forward American hop flavor. It's their most aromatically hopped beer, so it is made for easy drinking. Black Mocha Stout: Highland’s most robust beer has a very malty body with a large, roasted chocolate flavor, created from special roasted barley grains. Highland IPA: This west coast style IPA with American Chinook, Citra, and Centennial hops from the Pacific Northwest, with hints of tropical fruit, lemon rind, grapefruit and dank hops notes. Highland Pilsner: A finely nuanced pilsner with German Hallertau Blanc hops and three other Hallertau region varietals creating notes of stone fruit, pepper, and lush grass. Cold fermented with lager yeast for a crisp, dry finish. Mandarina IPA: This adventure-loving and aromatic citrus IPA is brewed with nuanced German Mandarina Bavaria and Hull Melon hops and bold, juicy American oranges. Daycation IPA: This IPA is lively and light-bodied, with stone fruit and herbal notes, while dry hops adds layers of bright citrus. Seasonal & Small Batch: Stop by throughout the year for seasonal beers (like the Clawhammer Oktoberfest and Cold Mountain Winter Ale) and plenty of small batch creations. Warrior Series: With bold aromas and flavors, often high gravity, styles will vary widely in this series. They are released a few times per year in limited quantities of kegs and 12-ounce four packs. 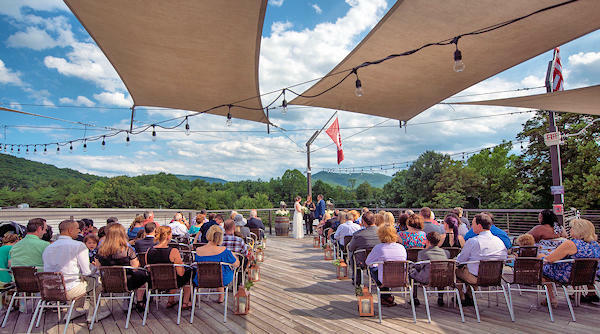 Weddings & Private Events: The Event Center and Rooftop Beer Garden at Highland Brewing host weddings and gatherings. Directions: Highland Brewing Company is just a few miles from downtown Asheville at 12 Old Charlotte Highway, Asheville. From downtown, take I-240 East to Exit 8 / Highway 74. Turn left onto Fairview Road. In just over a mile, turn right onto Old Charlotte Highway. You'll see their sign on the left. For more info - including their busy events calendar, go to Highland Brewing's Web site.